Boat shoes, decks shoes, we don’t care about the technicalities of the name, but rather the specifics of its design and feel. These summer classics are as much a staple to every man’s shoe collection as anti-persperant is to a fat weight lifter. An English classic that is recognised worldwide. When we first discovered the finer details of deck shoes, we were amazed at how few chaps rocked them, but now they’re a trend for this season, it seems that more guys are taking notice. They are a lot more practical then many would think! Designed to meet yachtsmen’s requirements, they have a firm grip which would not damage decks, waterproof leather which drain but not crack, and laces which tightened to fit all round, while allowing the shoe to slip on and off. These ASOS incarnations made it onto the list because they provide the buyer with a unique tongue style. Rather than having the traditional two side pieces tied together, this design is a single-moulded piece. This fresh mint green also provides you with a colour that most average guys will pass by. All the better for you to stand out and set the trends. But when a lady approaches you due to your big boy shoes, please make sure your breath matches the minty-freshness of the shoes. Please. These deck shoes come from the well-established British brand. If anyone knows about ‘preppy’ style then you can trust that Brooks Brothers do. These are perfect if you’re looking for a little change to your shoe; the vibrant colours go perfectly with this seasons bright pastel tones. Not only that, but at an offer which see’s you buy one and getting the second for half the price, means there is no excuse for an absence of colour in your summer wardrobe. Pair them with some pastel shorts, a polo and some Ray Ban glasses for the classic summer look. They’ve also enlisted the services of famous product designer Jeff Staple to put his trademark pigeon logo on the tongue (the pigeon range is so hard to get your hands on that people have actually died in America trying to get a pair, check out the link and watch the news report!) I doubt you’ll get hold of a pair of these. The only way is to kill, and if that’s your plan, we’re not involved…(unless you get us a pair too). This pair from FCUK really caught my eye when I saw them in Westfield. The touch of suede help them stand out from the rest and mixed with black leather, they provide a sophisticated, classy feel. Nothing more to say. 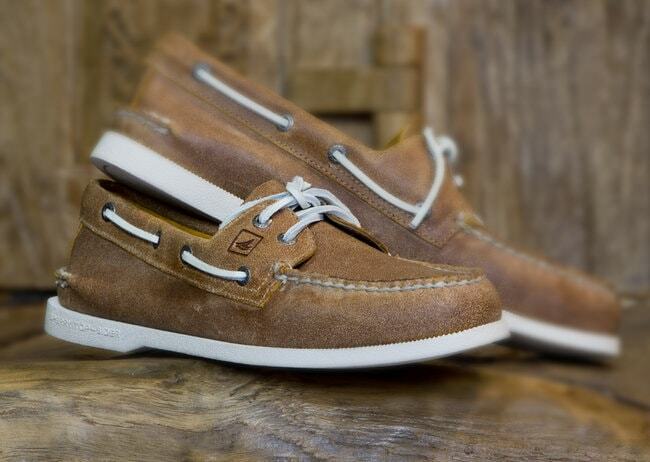 You can’t ever go wrong with classic brown leather deck shoes. They are as versatile as Birds Eye Potato Waffles, as brown can be worn in winter as well as in summer. They also lend themselves to pairing with jeans a lot more than the coloured types, which have to be worked intelligently into an outfit. Timberland are a trusty brand and have been making these styles for years, so the craftsmanship is as good as Lewis Hamilton behind a wheel. Just don’t expect to be turning too many heads with the subtle colour. More a ‘fit in’ shoe. There you go; practicality meets style as well as being on trend (as much as we hate that). The deck shoe is the perfect spring/summer choice of footwear. Are you saving or wasting on the school backpacks? Don’t Miss These Facts About Buying Roller Blinds!